Hill and Little Sutton Quarter was one of the five districts of Sutton from ancient times until the nineteenth century. It contained a large area of common land, in a swathe from Four Oaks Common in the west, then Hill Hook Field, then across Lichfield Road to a common called the Oslet, then the vast Hill Commons and over to Roughley Common and Nicklins Field in the east. The map shows a number of dwellings on the fringes of the commons - north of Four Oaks there were a few cottages and a farmhouse; some houses are shown along Blake Street near Watford Gap; there is a cluster of houses at the edge of the common near Hill Wood, and some to the east at Slade Lane, between the commons and the boundary of Sutton at Collets Brook. There was even a cottage at the northernmost tip of the wedge of land near Little Hay. Most, if not all of these originated as squatters holdings in the sixteenth century. The farmland within the arc of commons was organised in open fields in the Middle Ages, some of these were bounded by the lanes shown on the map. Three open fields were worked by the villagers of the hamlet of Hill, their houses being strung out along Hill Village Road; another three belonged to Little Sutton, which extended from the Fox and Dogs pub to Marlpit Lane. There were smaller settlements, mostly cottages rather than farms. Roughley was a ribbon development of cottages along Slade Road, while Hill Hook probably dates from the thirteenth century as an off-shoot of Hill Village. There were about fifteen houses at Four Oaks (but Four Oaks Hall was in Great Sutton Quarter), and a few artisans’ dwellings at Mere Green, shown on the map as Mare Pool. South of Mere Green was Ley Hill, which had its own patch of common land. The Rector in 1721 estimated that there were 60 “free tenements” and 48 cottages in Hill and Little Sutton, while an earlier record, the Hearth Tax of 1674, gives 53 householders and 48 paupers. The largest house in this quarter in 1663 was Mrs. Payton’s house with six chimneys - this was Marlpit Hall (now demolished) in Marlpit Lane - in 1674 Mr. James Littleton lived there. The next biggest house, with four chimneys, belonged to another gentleman, Mr. Ralph Cooper, also near Little Sutton. The other gentry families in this quarter, the Turners and Yardleys, had only five hearths between them. Lichfield Road passes through Hill and Little Sutton Quarter, described by Riland Bedford; “a tortuous and narrow Road led to Mere Pool and thence up the village of Hill to the common which occupied the slope towards Lichfield” (History of Sutton Coldfield 1891). This road was turnpiked in 1807, and much improved by the Turnpike Trust in the 1820s - the present Lichfield Road which by-passes Hill Village, dates from 1827. London Road was the carriage road from London to the north-west in the eighteenth century and forms the boundary of this quarter near Canwell Gate for a short distance. 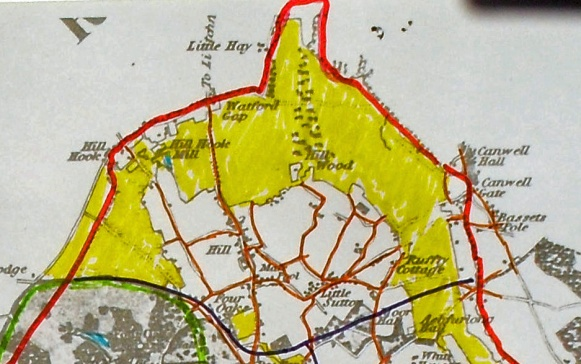 Hill and Little Sutton Quarter, based on Greenwood’s 1822 map of Warwickshire - the purple boundary line is approximate, commons are coloured yellow. 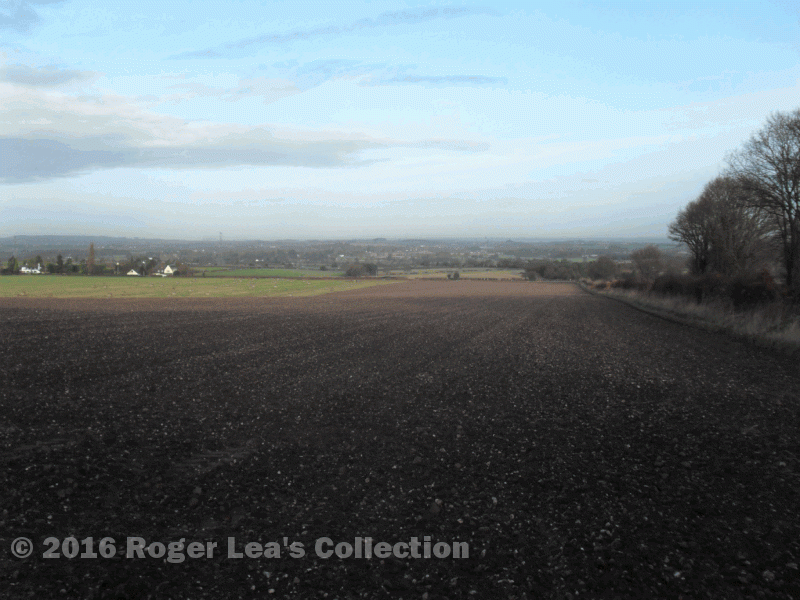 These fields were once part of the vast Hill Commons, sloping down towards Lichfield.